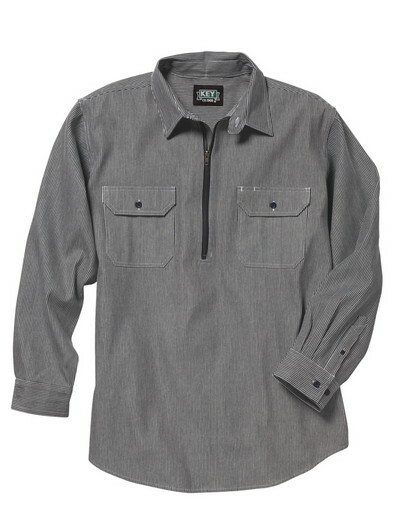 This KEY Pullover Logger Shirt provides Comfort while remaining exceptional for rugged and harsh conditions. This Functional Work Shirt is 9 oz. 100% Cotton, offering Breath-Ability and Comfort. Featuring a Banded Collar, Two Chest Pockets and Button Flaps, and Long Tails for convenience. Hickory Stripe Logger Shirts are the "KEY" to Quality. KEY Logger Shirts are specifically designed with the input of loggers and are "Plus-Sized" to allow more room in the chest, shoulders, arms and neck for the special fit and action needs of loggers. If you have never worn KEY Logger Shirts before, we recommend purchasing a single shirt until you are certain of your size.